(Newser) – Amber Vinson's family has what appears to be great news for all those Ohioans who came into contact with the Dallas nurse: She is free of the disease. So says a family statement asserting that "as of yesterday evening, officials at Emory University Hospital and the Centers for Disease Control are no longer able to detect virus in her body," reports WFAA. The one caveat is that a spokesperson for the Atlanta hospital tells DallasNews.com that she was unaware of any such development. The CDC has yet to make a comment, either. This whole Ebola "crisis" that killed zero Americans was hugely overhyped by the media and politicians for their own benefit. I hope all the Chicken Littles have calmed down, but don't worry they all be wetting their pants again over another phony crisis: like ISIS conquering America (what a joke!) and illegal immigrants bringing some new deadly disease that will kill all U.S. citizens. These scaredy cats never give up. Face it, we now live in the Republic of Fear and Paranoia where huge numbers of people will believe absolutely anything they read on the some crackpot internet site without ever checking for sources or documentation. All the people who hung with Mr. Duncan while he had a 103 degree temp the first time he went to the ER where he was turned away--are out of isolation and fine. So, Amber who got on a plane with a much lower temp--why wouldn't all those people be fine, too? Do you think that anyone in America will learn the difference between highly infectious and highly contagious? Think not. Get a flu shot. 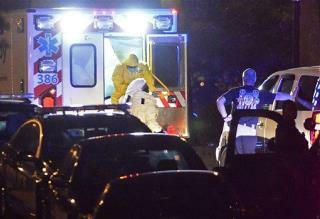 Ebola is not the pandemic you thought. H1N5--that's what you're gonna be wishing hadn't popped up one day. Today--a kid gets a vaccine for chicken pox--well, a kid whose parents aren't morons. When my kids were small they didn't have that and you just took your children over to someone who had it and held a bucket and rubbed lotion on them. Highly contagious diseases have vaccines--cause they're so contagious that everyone in the room gets it. So, anyone worried about Ebola who won't even bother to vaccinate themselves from stuff that is highly contagious as opposed to highly infectious has really got to ask themselves what part of the herd are they? They part that's protecting everyone even the idiots who spread whooping cough or the part that nature is culling? Cause nothing has ever said we are totally ignorant when it comes to the science of viruses like this last few weeks. Wait, is this the one that flew on a plane, knowing full well that she was sick?